This example shows how to robustly tune a PID controller for an uncertain mass-spring-damper system modeled in Simulink. where is the force applied to the mass and is the horizontal position of the mass. We can use a PID controller to generate the effort needed to change the position . Tuning this PID controller is easy when the physical parameters are known exactly. However this is rarely the case in practice, due to a number of factors including imprecise measurements, manufacturing tolerances, changes in operating conditions, and wear and tear. This example shows how to take such uncertainty into account during tuning to maintain high performance within the range of expected values for . Use the "uncertain real" (ureal) object to model the range of values that each parameter may take. Here the uncertainty is specified as a percentage deviation from the nominal value. Filter coefficient in PID controller should not exceed 100. 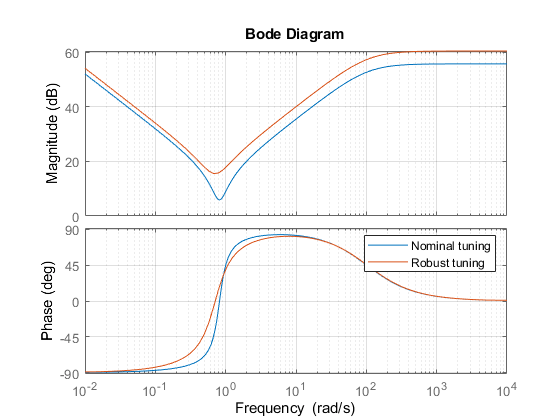 Create an slTuner interface for tuning the "Controller" block in the Simulink model, and use systune to tune the PID gains and best meet the two requirements. 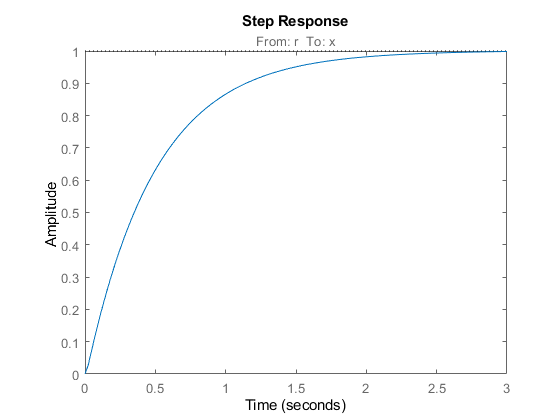 Use getIOTransfer to view the closed-loop step response. The nominal response meets the response time requirement and looks good. But how robust is it to variations of ? To answer this question, use the "block substitution" feature of slTuner to create an uncertain closed-loop model of the mass-spring-damper system. Block substitution lets you specify the linearization of a particular block in a Simulink model. Here we use this to replace the crisp values of by the uncertain values um,uc,uk defined above. 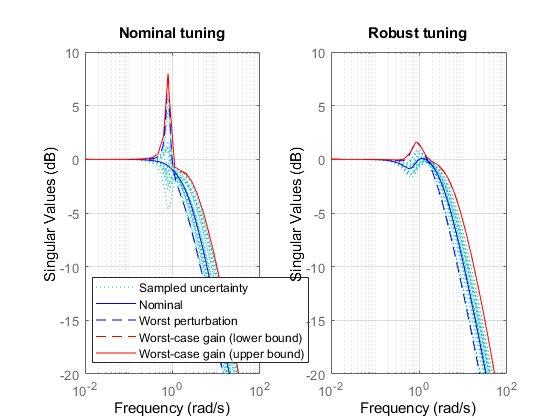 To assess the robustness of the nominal tuning, apply the tuned PID gains to the (untuned) uncertain model UST0 and simulate the "uncertain" closed-loop response. 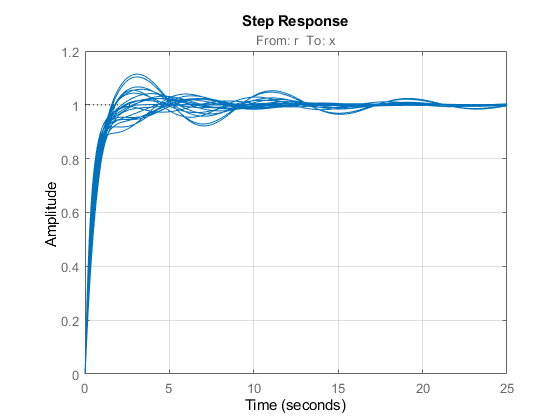 The step plot shows the closed-loop response with the nominally tuned PID for 20 randomly selected values of in the specified uncertainty range. Observe the significant performance degradation for some parameter combinations, with poorly damped oscillations and a long settling time. To improve the robustness of the PID controller, re-tune it using the uncertain closed-loop model UST0 rather than the nominal closed-loop model ST0. Due to the presence of ureal components in the model, systune automatically tries to maximize performance over the entire uncertainty range. This amounts to minimizing the worst-case value of the "soft" tuning goals Req1 and Req2. 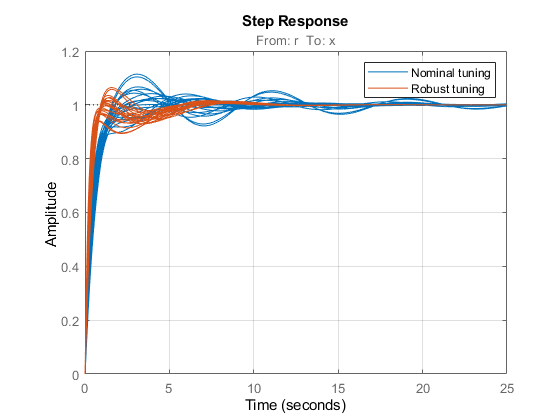 The robust performance is only slightly worse than the nominal performance, but the same uncertain closed-loop simulation shows a significant improvement over the nominal design. This is confirmed by plotting the worst-case gain from to as a function of frequency. Note the attenuated resonance near 1 rad/s. A comparison of the two PID controllers shows similar behaviors except for one key difference. The nominally tuned PID excessively relies on "cancelling" (notching out) the plant resonance, which is not a robust strategy in the presence of uncertainty on the resonance frequency. For further insight, plot the performance index (maximum value of the "soft" tuning goals Req1,Req2) as a function of the uncertain parameters for the nominal damping . Use the "varying parameter" feature of slTuner to create an array of closed-loop models over a grid of values covering their uncertainty ranges. 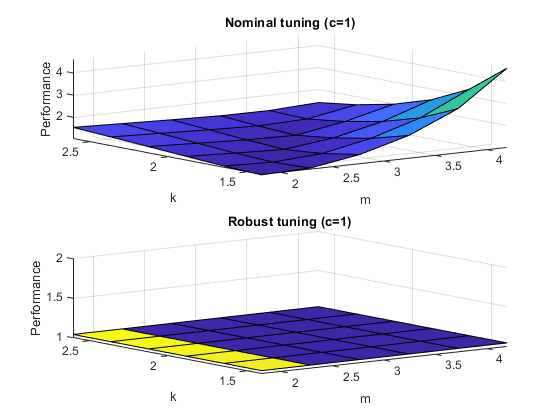 This plot shows that the nominal tuning is very sensitive to changes in mass or spring stiffness , while the robust tuning is essentially insensitive to these parameters. To complete the design, use writeBlockValue to apply the robust PID gains to the Simulink model and proceed with further validation in Simulink.